As a child, I was rarely allowed to eat sugary breakfast cereal. It was always corn flakes instead of frosted flakes, or rice crispies instead of cocoa crispies. So my sister and I loved it when we went to stay at my gran’s house. In preparation for our visit, she would always buy a variety pack of mini boxes of cereal. Each pack had 8 mini boxes of all the breakfast cereals your mum would never let you eat. The really tasty (i.e. full of sugar), colorful (i.e. full of artificial colors) cereals, made even more fun by their miniature size. 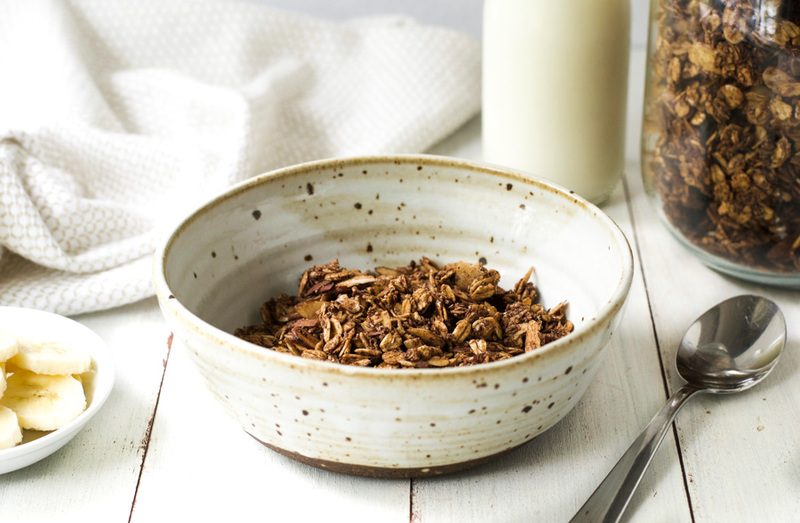 Well believe it or not, it was those variety packs that inspired this recipe for healthy chocolate almond granola. Last year while visiting the UK, my daughter caught sight of the very same cereal variety pack that my gran used to buy. Despite having not seen one before, she instantly recognized it as being full of unhealthy (but delicious) food that I would disapprove of. And so she persuaded me to let her have it as a holiday treat. Now, whenever we go on holiday, she seeks out that same variety pack knowing that my nutrition guard is usually down on vacation. Our recent trip to Legoland was no different, except this time she only wanted the cocoa crispies. She just loved the fact that she ended up with chocolate milk (another food that is rationed in our house). 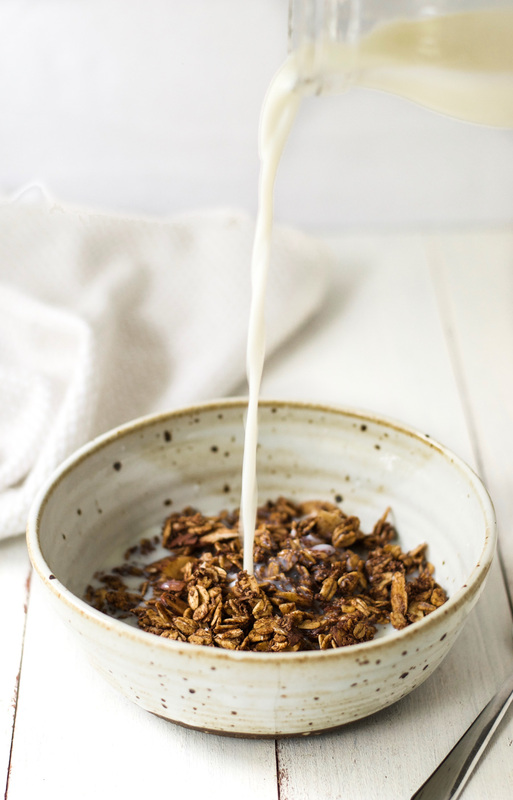 As someone who loves to create healthy versions of popular recipes, I got straight on to making a healthy version of cocoa crispies as soon as we got home from our trip. My daughter already loved my cranberry almond granola recipe, so I decided to tweak that instead of starting afresh. 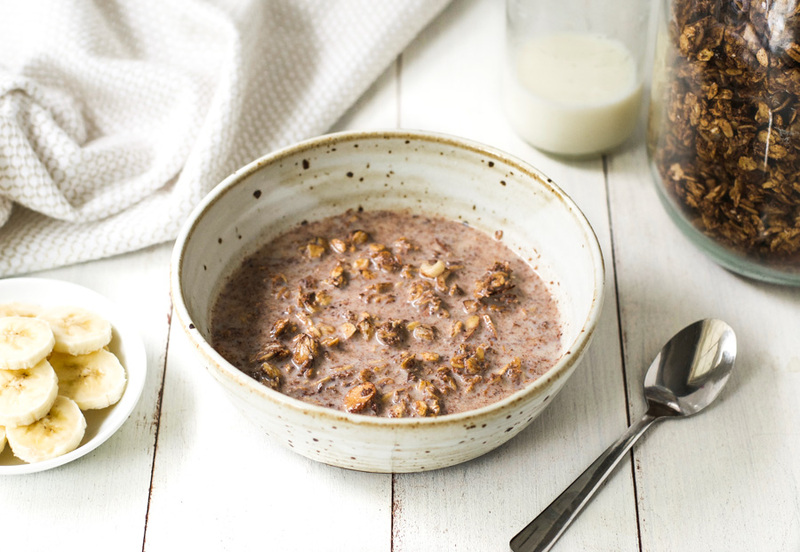 The result was this delicious chocolate almond granola, with a hint of coconut. You can serve it with greek yogurt and fresh fruit to make it fancy. But for me, the best way to serve it is with nothing but ice cold milk. 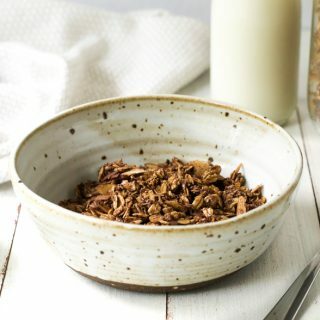 Do you know the best thing about this recipe (aside from the fact that it contains 30% of your daily fiber needs in 1 serving, and just 5 grams of sugar)? It really does turn the milk chocolatey. And that chocolate milk flavor takes me right back to the kitchen table in my gran’s house as a child. Such fond memories. What was your favorite childhood breakfast? 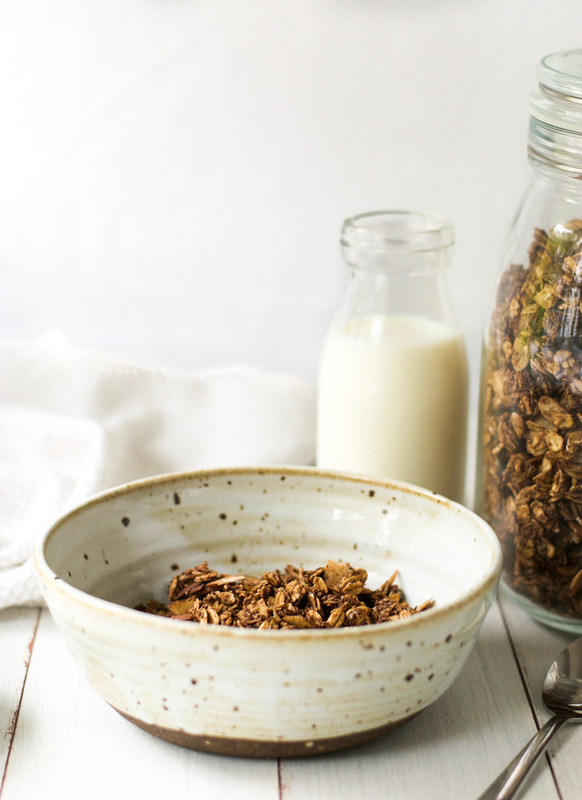 This healthy chocolate almond granola really does turn the milk chocolatey, just like cocoa crispies (except far more nutritious). In a large bowl, combine all ingredients except for the egg white. In a small bowl, whisk the egg white until slightly frothy. Add it to the large bowl of ingredients and mix well. Spread the mixture on a baking tray, press down, and put it in the oven for 35 to 40 minutes, until it is all nicely toasted. Remove from the oven and let the granola cool completely on the baking tray. Once cool, gently break up the granola into clusters and store in a jar or tupperware for up to 2 weeks. Sorry I haven’t posted lately, been too busy enjoying the fruits and veggies of you suggestions. 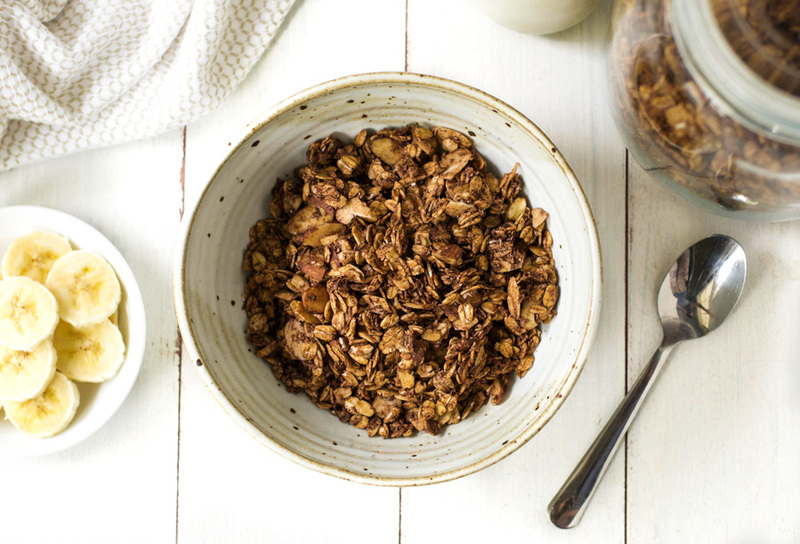 And now this delicious granola! I was looking forward to a new granola recipe. But, unfortunately, the time indicated, 35-40 minutes, is too long. My batch burned before 30 minutes. Will try again. I am so sorry to hear that. How frustrating and disappointing. I haven’t experienced that. Did you definitely have your oven at 300 degrees F? I wonder what happened.